Our Lime Coconut Aloe soap evokes a frosty Caribbean cocktail. The bar will cools you down and perks you up. 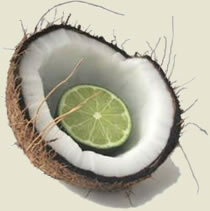 Enjoy the full fragrance of fresh lime while your sun-drenched skin welcomes the moisturizing comforts of coconut oil. We pack an extra measure of the oil in every bar. To top off this luscious summer blend, we add the juice of aloe vera, the well known succulent especially soothing for sunburned skin. Aloe is also anti-inflammatory, excellent for the relief of itching. The soap’s color comes from nettle. You’ll love this bar so much you’ll want to use it year-round. Pictured here: the humble lime in its natural habitat. Love lime scent? Try our Beard Oil!